By boosting the level of amines which clear the head, scientists have found. The reaction between amino acids in the bacon and reducing sugars in the fat is what provides the sandwich with its appeal. 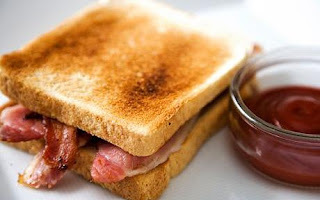 Ms Roberts said: "The smell of sizzling bacon in a pan is enough to tempt even the staunchest of vegetarians. There's something deeper going on inside. It's not just the idea of a tasty snack. There is some complex chemistry going on.